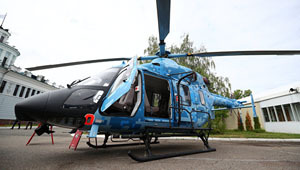 Specialists at Kazan Helicopters of the holding company Russian Helicopters (part of Rostec State Corporation) have completed testing of an Ansat helicopter equipped with a emergency floatation system. It is designed for emergency water landings and is used to save the lives of crew and passengers. The emergency floatation system is currently in the certification phase. When the work is complete, the Federal Air Transport Agency will approve the major modification. The emergency floatation system includes inflatable buoyancy chambers (ballonets), two life rafts, an emergency life support package, including a radio beacon for rescuers to determine the landing site. In the event of a ditching, this emergency set keeps the helicopter afloat for 30 minutes. This is enough time to deploy the system’s life-saving equipment, and to safely leave the helicopter. We are continuing our work to improve the air safety of Ansat, as it is actively used in the transportation of passengers and patients who require emergency medical assistance. Additionally, helicopters equipped with a ditching system will be able to conduct flights to oil companies' facilities located at a considerable distance from the coast, and participate in search and rescue operations above the water. Together with high performance, this will make Ansat even more attractive to fuel and energy companies and rescue services," said Russian Helicopters CEO Andrey Boginsky. Ansat is a light, multipurpose twin-engine helicopter manufactured by Kazan Helicopters. According to the helicopter certificate, its design allows it to be converted into a cargo version or a passenger rotorcraft that can carry up to seven people. Ansat is certified for use at temperatures ranging between -45°? and +50°?.